In this Student Insights interview, one of our 10653NAT Diploma of Positive Psychology and Wellbeing Byron Bay graduates explains how the course helped her make significant and positive change within her school. I have always had a long-term interest in many elements of positive psychology, before I knew of the term and field of research known as Positive Psychology. I had been doing work with students and staff for many years, using terminology and ideas such as the power of positive thinking, the glass half full, optimism and success being linked to your attitude. For example, principal speeches at school assemblies, general interactions with others, and professional development activities with staff centred around these positive themes. Once I came across the field of positive psychology, started to explore it, and appreciated it as a science, I was thrilled. It gave me a consistent language and broader understanding. Yet I still felt there was so much more to learn. I also wanted to further add credibility to this long-term interest and felt that undertaking a Diploma level programme with a real qualification would be useful, as well as the learning content being of interest to me. I have another couple of Diplomas, in Counselling and Marketing, and I felt this helped round out my knowledge in both a professional and personal context. I wanted to learn from experts in an interesting, engaging and challenging way, and I was very keen to formalise my learning in a coherent way. I originally enquired about the course in 2015, yet had not committed at that point. I explored what else might be out there yet nothing compared to the Langley Group Institute Diploma, and once the Byron Bay Retreat option came up, I knew that was perfect for me. I jumped in for an amazing week at Elements of Byron, and then committed to completing the Diploma with a raft of excellent assessments that consolidated my learning and stretched me in a very positive way. Whilst I had some prior knowledge of positive psychology concepts, undertaking the Diploma of Positive Psychology and Wellbeing was so refreshing, and I was captivated by all of it. The core modules were facilitated so well, each component was well-paced and with lots of experiential activities during the week. I also think that a course like this attracts people of a particular generosity and positivity, and whilst our group was made up of people from a range of places, industries and backgrounds, we learned so well due to the synergy in the group. I struggled to narrow the elective choices to two, and working in Education I initially felt that the Positive Education module would be appropriate, yet a little expected. So, in the end, I chose the Electives of Positive Leadership and Positive Human Resources as an extra challenge. Both of these electives were, of course, relevant to my context and the readings and assessment activities pushed me into new territory. I admit that I stumbled with the first assessment in the core module as in my field, an academic writing approach is what I am used to and this is not what the Diploma assessment expectations are. It’s actually a much more honest and reflective approach that I enjoyed adapting to, and subsequently worked through each assessment with assurance. I completed my assessments within several months as I got into a good rhythm, and the learnings from the week at Byron Bay remained fresh. Support from the assessor was also excellent. My ‘Positive Ripples’ have been tangible achievements, as well as positively influencing others. I am Principal of a government school for students in years 10-12, where students undertake the challenging International Baccalaureate Diploma, an international qualification. Classroom teaching and student learning is the core work in schools, with the principal’s responsibility being to ensure the best conditions for this to occur. The best conditions are created and maintained by ensuring a safe, supportive and happy place to learn and work. Perfectly aligned with the elements of positive psychology. So back to school to spread some positive ripples. With any new initiative, it’s important to have real support and influence from the top, so the school principal having the qualification of the Diploma in Positive Psychology and Wellbeing demonstrated a commitment to this agenda. We had established a small wellbeing committee in 2016 comprised of staff and students who had tinkered with some wellbeing initiatives such as celebrating mental health week as a positive “spring into wellbeing” week, that changed the emphasis from dealing with negatives, to a more positive approach. A range of activities were attached to this, that focused on strengths, fun and Martin Seligman’s PERMA+ model; Positive EMOTION, ENGAGEMENT, RELATIONSHIPS, MEANING, ACCOMPLISHMENT + HEALTH – eating well, moving regularly, and sleeping deeply. Completing the Diploma in Positive Psychology and Wellbeing has better enabled me to be a knowledgeable workshop facilitator for a range of staff professional development activities, and an influencer of practice. A focus each term on a particular strength from the VIA Character Strengths. All students and staff undertake the VIA strength survey to determine their signature strengths and can adorn their laptop with stickers displaying their strengths so others know how working in different strength based groups might work for them. Wellbeing themed days with a range of new, tried and true “happiness” activities. Gratitude boards in the school cafeteria and the staff rooms. 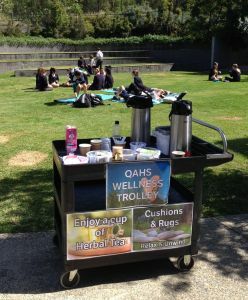 A wellbeing trolley including shade umbrellas, cushions, picnic rugs and games. Chill zones linked to themed days, with maker spaces including lego, happy beads for practising gratitude, and marbling art to mention a few. Mindfulness activity zones: colour pencils and colouring sheets in the library and cafeteria with other mindfulness activities. The elements of positive psychology written into all year levels’ care programme. Weekly Random Acts of Kindness. The language of positive psychology pervades the campus, with signage, quality posters, visuals and messages on TV screens, happy music in the mornings instead of bells. Our Head of Department Global Learners is the driver for much of this activity and is supported with a dedicated budget. One of my principal addresses at awards night was “Positive Psychology 101” as one forum for educating parents, as well as regular newsletter articles about positive psychology and as a school, what we are doing in this field. As in pretty much all workplaces, there are some who doubt anything new or different, so I have always worked with the early adopters and champions in the first instance, and worked with those people to influence the majority and hopefully the doubters. It has been interesting work to engage the doubters, yet I know that if the principal has done the work and shared the science, we have the critical mass required to make it work. This is evidenced by the number of staff using the language of positive psychology increasingly, almost automatically. 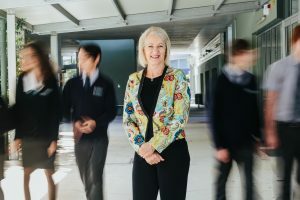 It has become “just what we do around here”, and it is reflected in official School Opinion Survey data, with very high levels of satisfaction across all domains by students, staff and parents. Apart from the positive ripples professionally, completing the Diploma has of course also contributed to my personal wellbeing in all sorts of positive ways.